Strawberry season is upon us, yay! I love strawberries and so do my kids. They taste amazing as well as being so pretty to look at. So I plan on using lots of strawberries this summer. 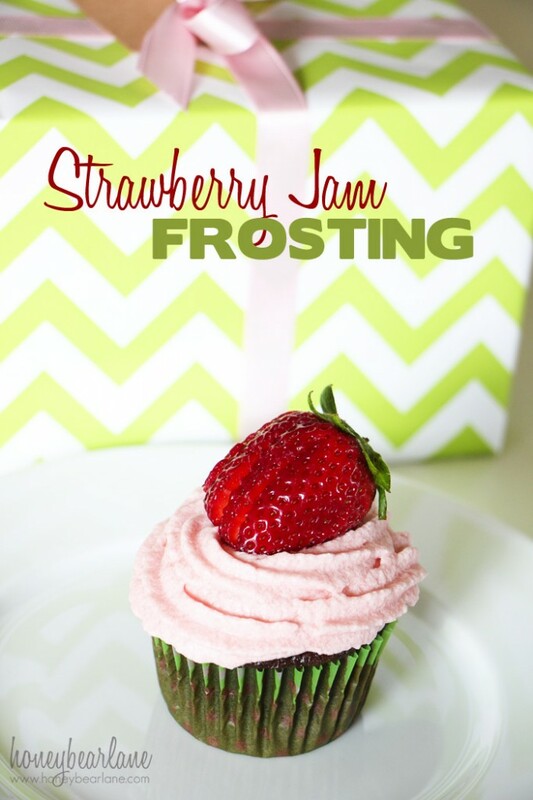 The first strawberry thing I tried the other day was Strawberry Jam Frosting. You start with a basic frosting recipe and add a secret ingredient or two. 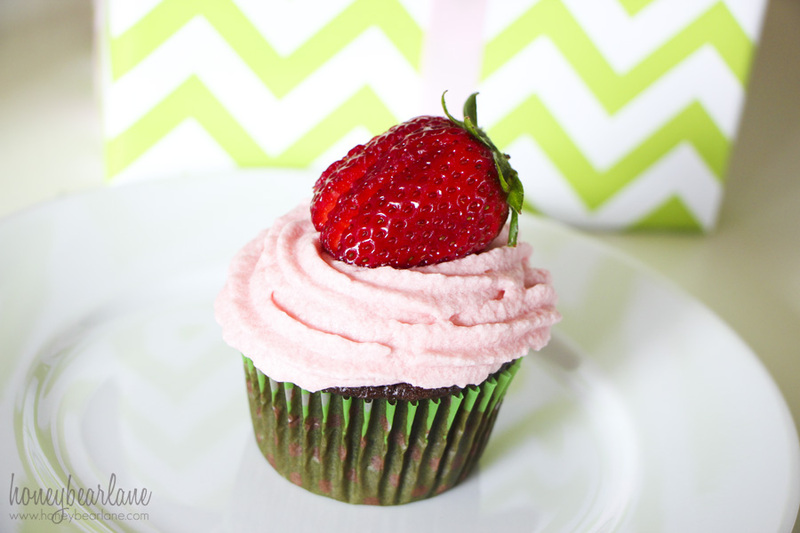 Super easy but makes an ordinary cupcake into extraordinary! This frosting recipe tasted great on a plain chocolate cupcake but I’m excited to try it on angel food, white, yellow, etc. To add a pretty little strawberry on top, wash the strawberry and dry it. Then cut the strawberry with a knife from the bottom to nearly the stem but not all the way. Make three cuts. It is SO easy to make food look pretty and then everyone is super impressed. Piping a cupcake is very easy. If you have the right materials, you probably know how to do it (the frosting bag and tips). But if you don’t, you can achieve a similar result by spooning it into a ziplock bag and cutting off the corner. Squeeze the frosting through the small hole and pipe the frosting on in a circular motion, starting from the outside to the center. Whip the softened butter with vanilla. Then slowly add in 2-3 cups of the powdered sugar. Add the strawberry jam and whip. Add the rest of the sugar and mix well. If it's too thick, add a little milk (very little, 1 tsp at a time) until you reach your desired consistency. It should be fairly thick so it won't spread once you pipe it on the cupcake. Remember you can save this to your Ziplist by hovering over the frosting recipe and clicking on ‘Save’! Linked up with Saving 4 Six, Tidy Mom, The Pin Junkie and Katherine’s Corner. How many cupcakes will this recipe cover? It covered about a dozen, but I used a lot of frosting on each cupcake.